Wolverine Human Services is always looking for ways to enhance the field of Child Welfare Services. In addition to our focus on our Mission and ability to implement new and exciting evidenced based approaches, we are also focused on enhancing the data management systems involved with our service provision. Wolverine Human Services began a strategic plan with Salesforce, the nation’s largest software provider to develop its own customer relationship management (CRM) system. 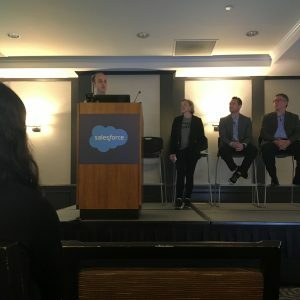 Salesforce was extremely interested in the Wolverine Human Services project and invited our agency to speak at Dreamforce, Salesforce’s annual user conference and the largest software conference in the world, in San Francisco September 25–28, 2018. During our presentation, Wolverine Human Services was able to illustrate how the use of Salesforce and the Nonprofit Success Pack (NPSP) has improved our ability to place children into better foster homes, at a faster rate, and with more success at each placement. Through our partnership with Salesforce, Matt Wollack has now developed Noble Child, the first and only functional, cloud-based intelligent analytic information system on the Salesforce platform to meet the growing needs of the child welfare industry. It is pretty amazing how the solutions to our own problems at WHS will soon be available to other agencies like ours. With Salesforce, the possibilities and opportunities truly are endless!